Age related bone fractures are a major concern in an aging population such as in the United States. Currently, bone mineral density (BMD) is used as an indicator of fracture risk, yet it is becoming increasingly clear that is has poor predictive ability on an individual basis. It recently has been demonstrated that bone quality is variable between people in a way that is not understood medically, but which might be understood using advanced mechanics methods. Dimensional analysis has led to the insight that there is a material lengthscale for materials that can predict fracture and fatigue damage of engineering materials. This research project is a collaboration between an advanced mechanics laboratory and an advanced bone mechanics laboratory that will create novel analytical methods for the problem of bone failure while, at the same time, the bone fracture problem will be a new challenge for the engineering analysts. This research will provide a biomechanical foundation for understanding a fundamental underlying feature of bone strength and fatigue resistance. Demonstration of the existence of an intrinsic lengthscale and its dependence on intrinsic material toughness could significantly change our fundamental understanding of how microstructured biological materials function. It also could be a seed towards developing a future bone assessment approach, which considers both bone microstructure and bone tissue properties in failure. In mechanics, dimensional analysis has led to the insight that an intrinsic lengthscale L* (a ratio of fracture toughness and strength or endurance) for a material emerges as a natural outcome of any boundary value problem of fracture and fatigue damage. When including a lengthscale in considerations of mechanical loading, the fracture/damage response becomes dependent on microstructural feature size, leading to a deterministic mechanical size effect of damage and ultimately failure. Intrinsic lengthscales have been documented experimentally for fracture experiments of bone. The research work will provide an early foundation for a new approach to the understanding of bone degradation and the severity of fracture risk and the degraded mechanical performance of aging bone which considers both bone microstructure and bone tissue properties in failure. M.A. Hammond, J.M. Wallace, M.R. Allen, T. Siegmund, (2018). MicroCT based FE model of bone core with tissue heterogeneity and anisotropy. Purdue University Research Repository. doi:10.4231/R7CC0XX4. M.A. Hammond, J.M. Wallace, M.R. Allen, T. Siegmund, (2018). MicroCT based FE model of single bone trabeculae with tissue heterogeneity and anisotropy. Purdue University Research Repository. doi:10.4231/R7H41PP9. This research investigates the reconciliation of opposed properties in material systems through the use of stereotomic architectures. Engineers and scientists continuously search for high damage tolerant materials and structures. Stereotomy is the art of cutting materials into geometric shapes. The cut blocks are then assembled into complex structures. Scientists have recently discovered new principles for the assembly process. The result is Stereotomic Material Systems with new architectures realized as interlocking assemblies based on single and multiphase tessellations. This research then aims to reconcile opposed properties such as strength-toughness, brittleness-ductility, and hardness-wave speed. It also aims to find approaches to control such properties. The outcomes will have impact on several technologies, including flexible electronics, battery systems, armor, and high temperature structures. The PI will develop related educational modules in the context of engineering mechanics. These activities will introduce pre-college students to engineering principles. The awardee also will develop new graduate-level educational content on architectured material systems. He will engage undergraduate students in related research experiences. Advances in the scientific discourse on architectured material systems will be undertaken through an international symposium on the subject. A collaboration with a small business will enable the implementation of the stereotomic material systems. Stereotomic Material Systems (SMS) are assemblies of polyhedra on underlying tessellation patterns. The present work focuses on non-regular single-phase and multi-phase stereotomic material systems. For static loading, measurements of stiffness, strength and toughness under quasistatic loading are conducted. Under impact loading, experiments to determine wave front speed, unit element velocity and decay rates are planned. 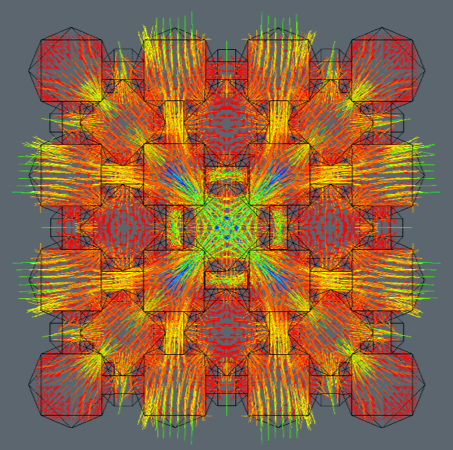 There are two main research questions: (1) given the large number of possibilities of tessellations providing potential architectural templates for SMS, and the option to consider multi-material systems, the question is how complexity in the SMS architecture would control SMS stiffness, strength and toughness. 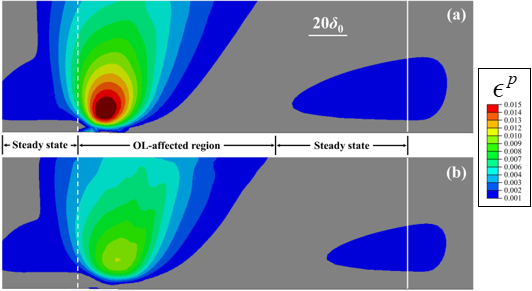 (2) since unit-to-unit element contact interactions in SMS are dependent on the degree of transverse deformation, the question is how such contact nonlinearity will manifest itself in the dynamics of the SMS response following impact loading, and how such dynamic response depends on SMS architecture complexity. 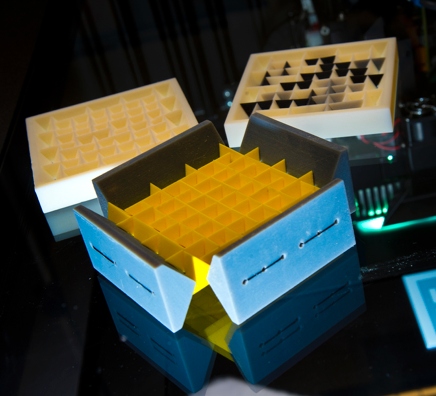 Multi-material 3D printing is employed to manufacture specimens. Experiments under static and dynamic mechanical load are conducted. Theory and finite element simulation are used in the analysis. This work is supported by NSF 1662177. We focus on architectured materials for energy storage systems as relevant for electric vehicles. Current battery systems in EVs are solely energy storage relevant but do not allow for a contribution to the mechanical response of the vehicle system. 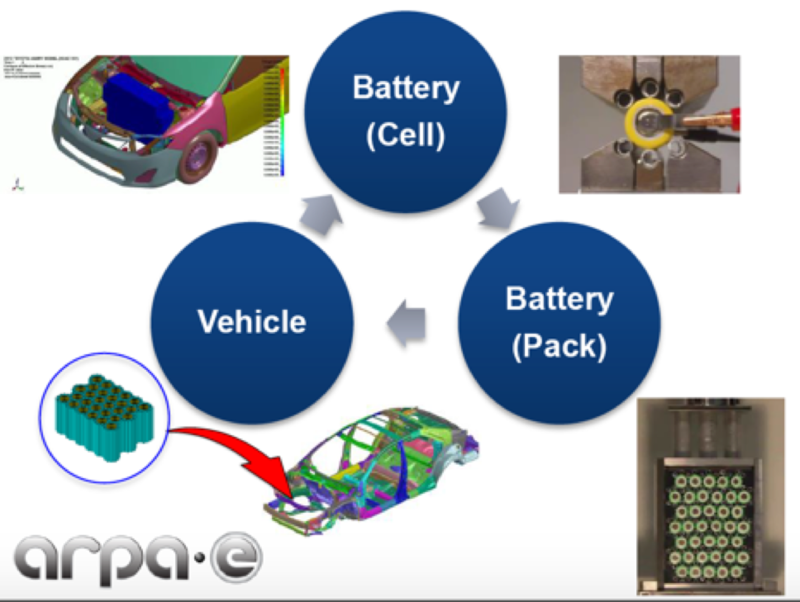 Our work contributes to establish a technology of impact and damage tolerant battery systems that can seamlessly be integrated into modern passenger cars without space and weight constraint. This work contributes solutions to the technical challenges of safety, cooling and structural reliability arising when implementing Lithium ion batteries in electric vehicles. This work is supported by arpa-e and Ford Motor Company. In collaboration with W. Chen. Our current research interest is in high temperature failure. In particular, we are interested in the mechanics of crack advance under creep-fatigue conditions. We currently consider such problems in the context of two distinctly different classes of nickel-base super alloys (IN 617 and IN 718). New designs for nuclear power plants and aircraft turbines seek to use these alloys as structural materials at increasingly high temperatures, up to 1000°C. Current models for creep-fatigue crack growth typically employ empirical rules that do not clearly generalize across operating conditions. We apply mechanism-based models to predict both fatigue- and creep-dominated behavior and increase confidence in safe operation across all operating conditions. Additive manufacturing (AM), where parts are built up in a layer-by-layer fashion, has also emerged as a promising manufacturing approach for alloys including IN 718. Using AM can provide significant cost savings over conventional wrought components. However, metal AM processes create unique, anisotropic microstructures that alter both the mechanical properties and characteristics of crack propagation, particularly at high temperatures. 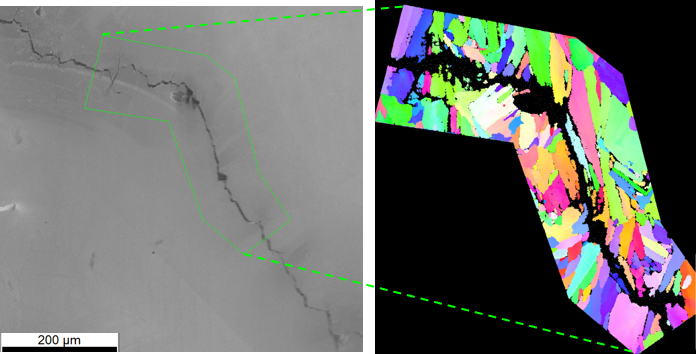 We are using experimental measurements of grain orientations, crack paths and growth rates, and crack-tip oxidation to develop a predictive model for high-temperature crack growth in AM IN 718. This work employs advanced cohesive zone models for material separation as well as visco-plastic strain gradient plasticity formulations. This work is supported by DoE NEUP and NETL. In collaboration with V. Tomar and J. Kruzic. 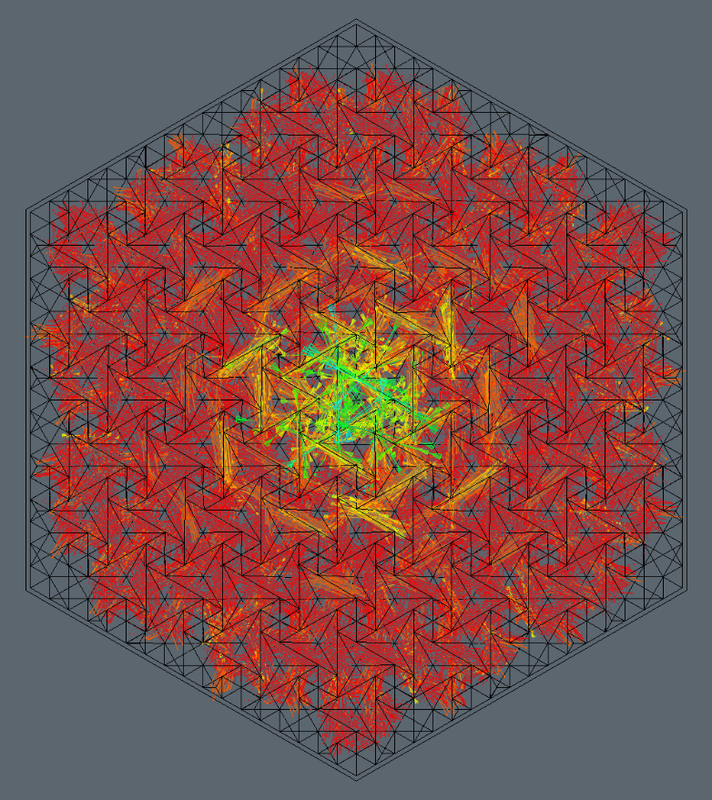 In this work we investigate computations of topology optimization under consideration of realistic failure criteria. This work is supported by ICSEMS - the Indiana Consortium on Simulation Based Engineering of Materials and Structures. In this work we investigate complex sheet forming processes in stainless steels with phase transformation, and the influence of the forming process on subsequent fatigue failure. 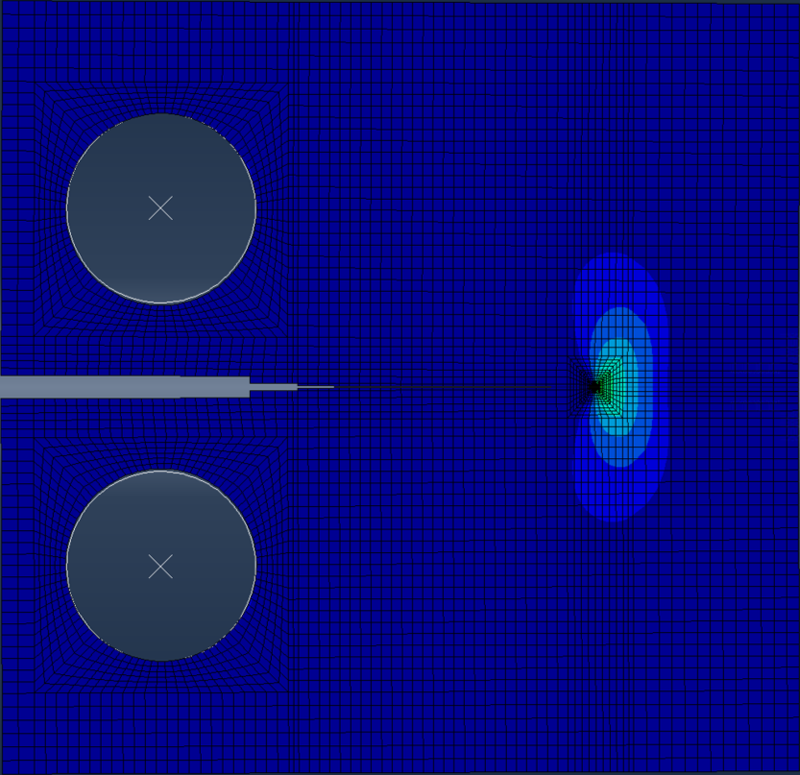 In this work we investigate the deformation and failure behavior of porous fiber materials. This work is supported by ICSEMS - the Indiana Consortium on Simulation Based Engineering of Materials and Structures and Knauf Inc..
We work on using additive manufacturing processes to realize new structures and devices. Our facilities provide access to a polyjet print system and an FDM print system. Several post-processing systems are available.